The Library of CCOM was established in Tianjin, 1950. In 1958, it was moved to Beijing following the school. The library of CCOM is now located in the central part of school's teaching area. 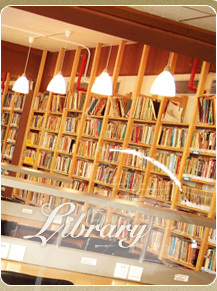 The total area of library is about 3983 square meters. As one of the most important teaching assistant sections, the library paid attention to enlarge the collection of library. Up to the end of 2007, the library boasts a collection of various materials, including books, journals, music scores, recordings and videos, electronic data base, over 500,000 items and formed an integrated service system including many functions, such as collecting, editing, circulating, reading, copying, audio-visual system, live recording, and internet data base searching, etc. The collections and services of library played a key role in assisting the teaching and academic research works at school. The library has got a staff of 40 and includes six departments: office, journal department, music score department, special collection, audio-visual center, and recording center. Since the end of 1996, the library has started using advanced internet system to update the global information and connect to other libraries and presses. The purchase channel of the library has been extended comprehensively through these new paths. In addition, the library applied electronic management on the service routines, including interviewing, cataloging, circulating, and data searching, based on international advanced experiences. Now, the library of CCOM has taken the lead in China on the quality and quantity of the collection and has established an integrated modern service and management system. The library also pays attention to establish collaboration relationship with other libraries attached to worldwide renowned universities and conservatories. In 1997, the library entered authentically global organization-International Association of Music Library (IAML). As the only member of IAML in Mainland China, the library participated in the construction and development of international music libraries enterprise. On December 2007, the library becomes the member of document delivery center and data exchange center between libraries belonging with BALIS (Beijing Academic Library & Information System). The library is looking forward to making more outstanding contributions for promoting the exchanging, sharing, and interacting of artistic resources between universities and arts conservatories.